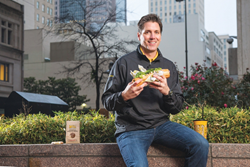 Jeff Sinelli, founder and CEO of Which Wich Superior Sandwiches, will deliver the opening keynote at the Restaurant Franchising & Innovation Summit. Early bird registration ends on Friday, November 4. Jeff will share with attendees not only how he created a successful business, but also how that business thrives in part by serving the community. "Jeff will share with our attendees not only how he created a successful business, but also how that business thrives in part by serving the community," said Cherryh Cansler, host of the summit and director of editorial of Networld Media Group, the publishing company that produces the event. "His presentation will be packed with actionable items for attendees to implement at their own businesses." After his keynote address, Sinelli will host a "spreading party," Cansler said. "We'll all work together for about an hour to make thousands of PB&Js for people in need around the Dallas-Fort Worth area." The summit will explore how franchises can leverage innovation in a variety forms — from customer experience innovation to kitchen and menu innovation and beyond — as a catalyst for franchise expansion. Attendees will discover progressive ways to build their business and attract both investors and customers, said Cansler, who developed the agenda. The Restaurant Franchising & Innovation Summit will make its global debut in London, July 18–20, 2017. More information about the summit will be available in the coming weeks. Founded in 2000, Networld Media Group is a leading business-to-business (B2B) media communications company specializing in digital media, associations and events in the mobile, self-service, digital signage, retail, food service and financial services industries. Online properties include ATMmarketplace.com, DigitalSignageToday.com, FastCasual.com, PizzaMarketplace.com, KioskMarketplace.com, MobilePaymentsToday.com, VirtualCurrencyToday.com, QSRweb.com, RetailCustomerExperience.com and ChurchCentral.com. Networld event properties include the Fast Casual Executive Summit, CONNECT Mobile Innovation Summit, Interactive Customer Experience Summit, Bank Customer Experience Summit and the Restaurant Franchising & Innovation Summit. Networld also operates the ICX Association. Its newest offering, Networld Press, provides clients with an all-in-one website solution featuring custom website design and ongoing editorial, content strategy and website updates. The annual Restaurant Franchising & Innovation Summit will be held March 28–30, 2017, in Dallas. Early bird pricing ends Friday, November 4.